If you don't know why you blog, you are going to have a hard time concentrating your marketing efforts to reach your desired audience. Furthermore, if you don't know why you blog, then how will your readers get any value from it? The first step to blogging is understanding why you're blogging and then you can start to produce valuable content. We also just implemented a blog reader survey into our weekly digest email, in which our blog readers can tell us the type of content they like the most, how they found us, and what they want to see more of. 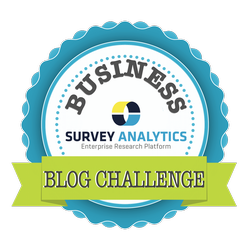 It's a great idea for anyone who wants to learn more about how their blog is performing. That's why today we're giving five reasons why we blog, offering a few tips and tricks for optimizing your business blog, and sharing some of our own blogging secrets. #1: To share information and educate - the first reason we blog is simply to educate our audience. We want to provide our customers and prospects with as much information as possible so they are informed and educated about our products and the methodology. We want our customer base to know as much as possible about market research so they can make better choices in their own research endeavors. Knowledge is the key to the beginning of any meaningful conversation. There is a rule of thumb in the blogging world, and it is known as the 80-20 rule. For this, follow that 80% of the content you post should be helpful and educational, while 20% should be self-promotional. We have found this to work well very well for us. #2: To stay on top of the latest trends and happenings in the industry - another great reason to blog is to stay on the cutting edge of trends and events in the industry. By recapping webinars, lectures, and other business events as they happen, we are staying current. Timeliness is a big factor when it comes to blogging and SEO, because search engines tend to favor content that is fresh and new. Keep this in mind when blogging, as it is better to cover an event right when it happens as opposed to waiting a week or more. #3: To keep our customers and readers engaged - running a business blog is a great way to drive engagement at a company. By blogging regularly (3-4 times per week at least) and sending out a weekly blog digest email, you are setting the pace for a consistent blog. Consistency is good. No one likes to read a blog that posts sporadically - once or twice here and then hears nothing for a month. In addition, at the beginning of each month, sit down and plan out your content for the duration of that month. It will really help you to stay on track and keeps your blog consistent. #4: To repurpose and recycle content and information - it is not always necessary to be writing original content for your blog. Sometimes, in fact most of the time, you should be repurposing content written by others and adding your insights. In fact, the 80-20 rule can be applied here too. 80% of the time, you should be recycling content that is already out there and adding your thoughts to it, and 20% of the time you should be creating original, self-promotional content. We have found this to be the perfect mixture of content for a business blog. After all, no one likes to read a blog that sounds like a sales pitch. #5: To participate in meaningful discussions - when blogging, it goes without saying that you should be sharing some of your content to social media. Once that happens, it sparks a discussion. The 5th reason why we blog is to participate in meaningful discussions online. Take for example, our CultureCode presentation on SlideShare. What started as a small presentation turned into a big discussion on social media. Not only were people viewing and downloading it, they were reaching out to us about our work culture and talking to us. At the end of the day, that is why we blog.